Ever Get Lost On The Streets Of Arkham? The haunted college town of Arkham is perhaps H.P. Lovecraft’s second-most famous literary creation (after the great tentacled one, of course). Thus it’s not surprising that many Lovecraftian tabletop games send investigators off on dark, doomed quests to peer into dim corners of Arkham. More often than not, they don’t come back. The primary gaming sourcebook describing Arkham is Keith Herber’s excellent Arkham Unveiled (published 1990). While long out of print, the same material (slightly revised and diluted) is available in H.P. Lovecraft’s Arkham. When we came to creating the first product in the Dateline: Lovecraft line, we naturally thought of Arkham (and the Arkham Advertiser) as a great setting for our newspaper-based scenario-fuel resource (see this posting for more on the upcoming title). The process of researching content to go into the large newspaper prop took us to a range of weird real-world historical places. It also forces us to take a really, REALLY close look at Herber’s depiction of Arkham — not just in the sourcebook, but also in scenarios written, co-written, and edited by Herber. What we found — particularly in the original printing of Arkham Unveiled — was a lot of evidence of the meticulous care with which Herber created his game “sandbox”. He clearly put a huge amount of care and attention into making something useful, but also faithful to the spirit of Lovecraft’s writing, and internally-consistent. Many of the scenarios which have made use of Arkham (or built on Keith’s sterling work) haven’t made much of this amazing attention to detail … but there’s more than enough information buried in the various published materials to portray Arkham as a vibrant and well-drawn backdrop for scenarios. The problem is finding the right details when you need them. While Chaosium’s books do include a few helpful indices in the main Arkham sourcebook, these don’t cover the primary scenarios (some of which, surprisingly contain a wealth of background and setting detail not in the sourcebook). They are also somewhat limited in scope. During the creation of Dateline: Lovecraft we were often stymied when trying to remember where some obscure historical personage was mentioned in passing somewhere in the text. We dearly wished someone had created a comprehensive set of indices to all the people, places, and addresses referenced. One weekend, I broke and compiled such a beast, exhaustively poring over the published texts and compiling what turned out to be a lengthy set of alphabetically-sorted notes. Today, Cthulhu Reborn is pleased to release (a tidied up version of) those notes as the Herber Arkham-O-Pedia. You can download the 43-page PDF right now, entirely free of charge. We are releasing this as a reference work that might help other writers (or even players) navigate the detailed description of Arkham and its ill-fated populace. The PDF is released under a Creative Commons license, making it free for you to re-distribute or to exploit for any non-commercial purpose. A short treatise on the system of street numbering used in different quarters of Arkham, and an alphabetical listing of Arkham’s streets and the numbering convention that applies to each one. We hope that this free reference work will help people create new and intriguing Arkham-based material that both draws upon Herber’s work, and also aligns with some of the core designs that make it such a compelling depiction. 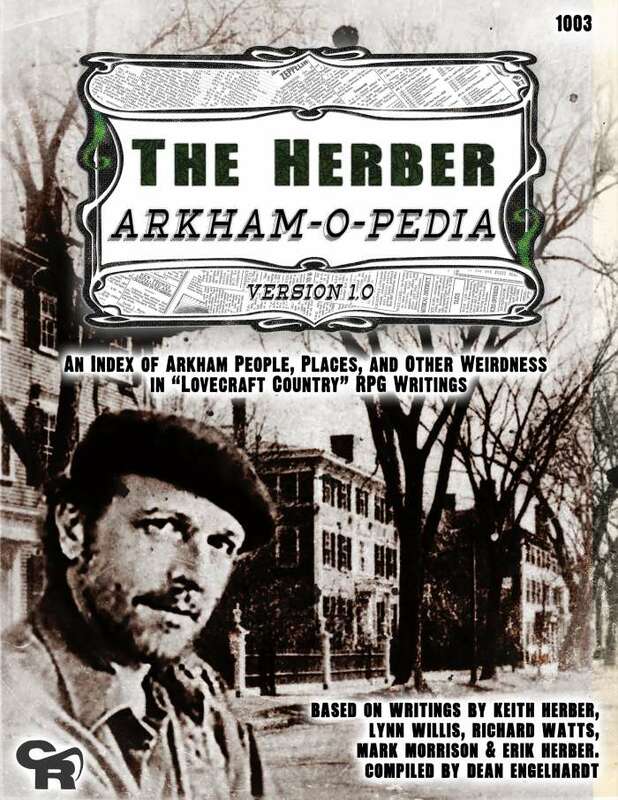 BTW: it is worthwhile mentioning that although the Herber Arkham-O-Pedia makes reference to content that appears in several books published by Chaosium, the PDF does not contain any material copied verbatim from those works. Nor does it contain any game content. This entry was posted on Wednesday, August 22nd, 2018 at 2:04 am	and posted in Cthulhu Game Aids, Dateline: Lovecraft. You can follow any responses to this entry through the RSS 2.0 feed. « Extra! Extra! Dateline: Lovecraft coming soon! I am impressed. This was indeed a good thing to provide to the community. I will definitely return the favor by purchasing Dateline: Lovecraft, as a result of your participation in the community as much as for any other reason. Kudos. What a lovely resource. Thanks, Dean! A delight to see Keith on the cover too. Thanks Mark … if you flick through the Arkham-O-Pedia you’ll find that one of your vintage scenarios (“The Hills Rise Wild”) also gets mined for Arkham references. Absolutely an amazing resource and I can see how much work went into it. Dean, was any thought given including Lovecraft’s own references to specific peoples, places, etc. in Arkham in the resource? Or was that considered just a step too far in terms of workload? I would be very interested to see such a reference. That’s an intriguing idea, Stuart, and not something I’d actually thought of doing. I assumed that HPL’s own references to Arkham all somehow got woven into Herber’s depiction of Arkham back in 1990 … but it would definitely be interesting to line them up side-by-side and see how well the game version of Arkham agrees with the details dropped by Lovecraft into a long list of stories. Perhaps something for a future revision of the Arkham-O-Pedia. Thanks for the idea! I seem to recall from the Arkham CoC materials that there was some mention of attempts to reconcile as best they could. Meaning that it wasn’t necessarily completely in accord with the HPL fiction. Good job, it makes me want to dig out that database of Arkham street numbers I created a few years ago. From memory the street numbers in the scenario (At least the ones that are presented.) turned out to be pretty consistent.